Wonderful album from the prolific DT and band. 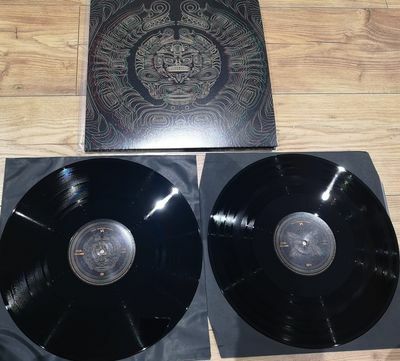 Double LP with stunning 3-D effect (if you have glasses) cover and inner artwork. From the 1st Vinyl Box Set - I'm splitting one out as this has been a very popular option for fans of the likes of Sabbath and Metallica who don't need or want the whole box set at once. Vinyl has been very carefully handled and played only once to quality check it (not all new Vinyl arrives as it should) and record to digital. In As New condition. ''Exclusive Download' you say?'' Yes! The digital download is a full-side-at-a-time recording of the actual Vinyl, done on a decent quality Audio Technical deck. Great if you don't want to play your vinyl every time you hear the album, but still like the Vinyl 'feel' for listening. This vinyl does not come with a download if you buy the box-set, so as far as I'm aware its a MuzakShack exclusive. It is only available to buyers of the Vinyl (you will own the Vinyl and are allowed a back-up copy) Its Hi-Res WAV format and will be sent via a private download link. Usually within 2 Days, sometimes a bit longer if I'm very busy (Part time sole trader) Please ignore the stated 10 days, this is to avoid eBay late shipment penalties which lower my performance level and impact the prices and service I can provide to buyers.